Excited about my new house purchase, I flipped open my laptop and pulled up my favorite retailer’s website: a beautifully designed, meticulously organized e-commerce experience. I found the appliances I needed, and checked out painlessly. I never received an email confirmation. Many days and piles of dirty laundry later, I still had no idea whether my washer and dryer were on their way to my house. Worse, neither did the retailer’s call center. Each time I called to ask, they told me my appliances were in a different location. In the end, I canceled my order and headed to a brick-and-mortar store. Building a loyal customer relationship can start with designing and building a great digital website or app—but it doesn’t end there. In order to architect the kind of positive customer experience that builds a loyal customer base—and the revenue that comes along with it—you have to do more than create amazing products and positive in-person interactions. You must also orchestrate the customer’s journey between those touchpoints. Poor customer experiences abound. In our current customer-centric economy, brands who foist these bad experiences onto people pay the price in lost revenue—especially if they don’t even manage to capture customer feedback and use it to improve their operations. Savvy companies, on the other hand, gather data from both customers and employees as part of their Customer Experience (CX) program (sometimes also called Voice of the Customer, or VOC). They then use this data to improve customer perceptions by fixing problems and planning moments of delight. What are VOC and CX? Because your employees’ experiences impact your customers, a successful CX program takes into account your team’s experience of their workplace as well. The first step to crafting a winning customer experience, according to Forrester, is to develop a vision that depicts how your organization wants customers to perceive it. What are your company’s core values? What is your mission? How are you different from your competitors? Your CX vision will flow from these distinctives. As an example, think about how the CX vision for Southwest Airlines might differ from the CX vision for USAA. Both are high-performing service organizations, but their industries and clientele differ. That translates into varying approaches to CX: while Southwest might seek to provide a quirky environment to connect with their customers, such an approach wouldn’t work for a financial organization like USAA, who needs to prioritize the security of their members’ money and optimism about their financial futures over fun. We’re a product agency at heart. How does WillowTree’s product focus help us support you in creating a great CX? Products are not campaigns. They’re long-term engagements that form the very foundations of our clients’ businesses. As a product agency, we start by looking at your existing digital experiences. But we don’t stop there. We review your customer’s entire journey with your brand. And because your digital products are now one of the most prominent avenues for customers to interact with your brand, as your digital product agency, we’re uniquely positioned to evaluate and improve your brand’s entire CX. We’ve found that your CX roadmap should focus on more than just finding and fixing customers’ and employees’ broken experiences with the brand; it should also encompass ways to delight and surprise them. As Chip and Dan Heath argue in their book The Power of Moments, building “peaks”—moments of delight—can sometimes deliver even more business value than fixing problems. These findings take advantage of emerging technologies like AR, as Regal had already done in their incredibly successful MovieBill app. 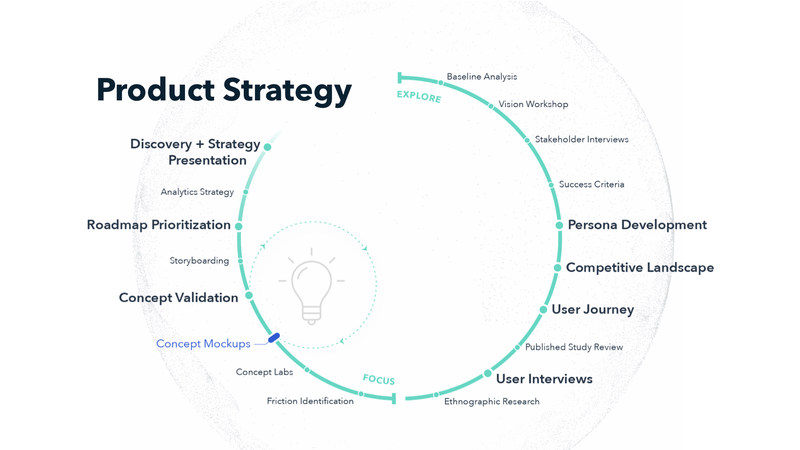 At WillowTree, we unite a cross-disciplinary project team—Product Strategy, Product Research, Product Insights, Product Design, Content Strategy, Software Engineering, Data Science, and Test Engineering—to not only identify problems in your company’s experiences, but also to innovate new ways to surprise and delight your customers. Here’s how we do it. One business-transforming product we built from scratch was Advertising Works, a sales enablement tool that allowed AOL’s team to execute targeted searches for valuable content like slides, market research, and KPIs instantly. The product also gave AOL staff the ability to create and export customized, client-ready sales presentations on-the-fly from desktop or tablet devices. Advertising Works transformed AOL’s sales process, making it more efficient and giving its sales team a competitive edge in the field. As we work with you to implement new ideas, we measure and monitor users’ reactions, iterating on each improvement and continuing to innovate new ones. For example, we worked with a large retailer to improve their website search experience. Over 8% of shoppers used the site’s search engine to find store locations—which wasn’t what the search was intended to do. By changing the label to “Search Products & Recipes,” we were able to lower location-based queries by 50%, funnelling many of those customers to the “find stores” search, and providing a much better experience. We can work with you to create changes—large and small—that impact your business. Want to draw on our experience to create a great one for your customers? Contact us today.